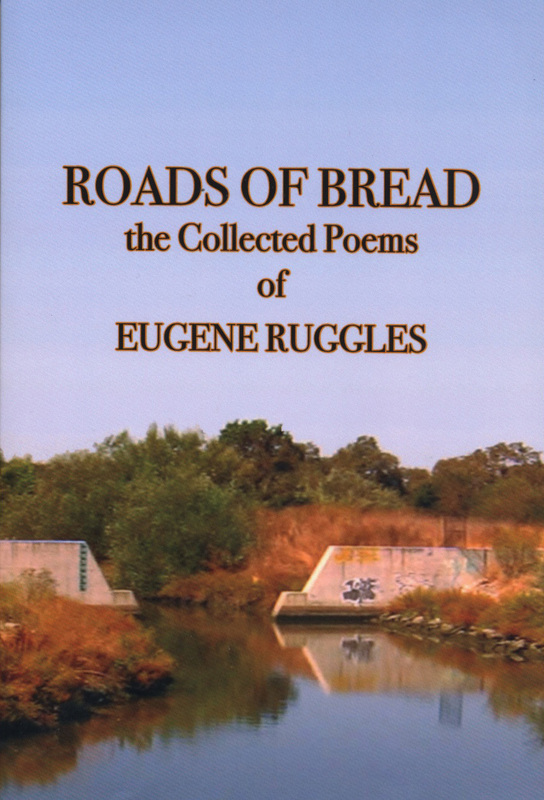 Roads of Bread, Petaluma River Press, P.O. Box 146, Bodega, CA 94922, 2009, 230 pages, $22.00 paperback; www.petalumariverpress.com. Eugene Ruggles shines in singularity. The feel of his genius is rough-hewn, homemade. You could call him a cross between Dylan Thomas and Philip Levine, and that would be useful, clever, but nowhere near the full truth of his writing. it drifts between my legs like it was breathing. I open my coat and hear snow inhaling the lake. frozen in ice like the last scream in a mouth. a small girl water carved out of my arms forever. That's the complete text of this powerful small poem that shows off many of the characteristics of his writing. Maybe the most obvious is what we could call his surrealism, the difficult, alogical quality of his imagery, here maybe less the raft "frozen in the ice like the last scream in a mouth"—because that image becomes 'logical' in association with the child's drowning—than that "black sunburn" "folded" through his chest. What a pure stroke that is, so strange and "god" like as it combines with the last line, the payoff that gives the poem its meaning. And we could think further there, too, about the moving alogic of water 'carving'. But Ruggles's imagery is never chosen purely for effect. It's not a portal to the 'marvelous', no spigot for the 'vesicles of the unconscious' as with Breton and the boys. Instead, his images are more like the deformations, the scars left by powerful emotion, and typically they look outward rather than inward, as here, the burn of grief for a little girl he couldn't save. Ruggles is a huge, open heart. It's the depth of his yearning, the reach of his embrace that give him his power and importance as a poet. There's a lot to question in that poem, a lot to cavil with. But—and this is true of his work as a whole—it's physical, kinetic. It's propelled by its thrusting verb, "take," at beginning and end, by the "tears" that act as an anaphora. And the drive of its rhythm is flawless. Look, especially, at the lineation and phrasing of its last four lines: "here, take… / for you are good at it, / my country, / my life." The poem has tremendous power, the raw joints of a jeremiad, and when it comes to its end it draws blood. 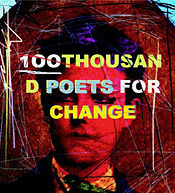 I'm using that word "jeremiad" advisedly, both because of the protest quality in his writing, above anti-war and later in the book for racial equality and about conditions of work and general living conditions, but also because of the prophetic, religious fervor of his poetry, maybe less Judeo-Christian than shamanic. Now there's only the moon. and my hand a yard turning dark. It's as if, perhaps, when he found himself removed from an outward caring, an outward striving, he was forced to look at an emptiness inside. Yet how strange and beautiful these lines and images are. A door between winds, "unable to close," and the final image of his hand as a 'darkening yard' is as alogical and unexpected as anything in his work; still, such an effective diminishing cadence to end on, lonely and blinking out. It's interesting, too, to see the names of poets he was reading, the only such names I can remember in the book, these writing brothers, Blake of visionary intensity, and the surreal flame voices of Roethke. yet I am always fed. Not 'dog eat dog' but man eat man. How quietly he says it, and how painfully—eating this other mouth—as in a ghastly dream, yet leavened with sardonic humor, "and it is not bad / as we say," which makes the pain more keen. A black man comes in to cash his unemployment check. He's at my right elbow, looking down, signing his name. forty-two years ago today, just before Pearl Harbor. they broke their lives over each other until they ended. The snow never stops looking for men in Detroit. …I opened the steel door and there he was. A short man, about five feet six, and thick. of another finger. This was the right hand. was in a dirty cast holding an oil can. Can you start today; sure, Goddamn, my first job. He gives a feel of his work at a press "as large as a freight elevator"; the workers are mostly black, the foreman Polish, "…All day Detroit exploded before me." That evening he quits, and the foreman takes him and two black workers out for beers. as though he wanted parts of it. But he didn't. and on the other side of the Detroit River, Watts was waiting for hers. Again that sense of reach and empathy, of black and white, of men and women, workers, gathering towards some imagination of freedom, of justice. There are other similar poems in this manuscript, "You May Do That," for Rosa Parks, "Busing Justice Through Freedom Summer," "You and Rodney King." Ruggles is a big poet, angular and awkward, who had grown unfashionable, who was mostly a quaint legend by the time of his death in 2004. But this is a major American writer, in his passion and yearning, the size of his heart and the force of his imagination. Anyone who reads Roads of Bread will see that. over their ashes? Invite them. Bring them in. They can rest here beside the fire of meat. Children sleep in the corners, taking notes. her footsteps are tablets I open to sleep. leaving no holes in this darkness. Around us, we can hear the dead sing. only some friends who are late. 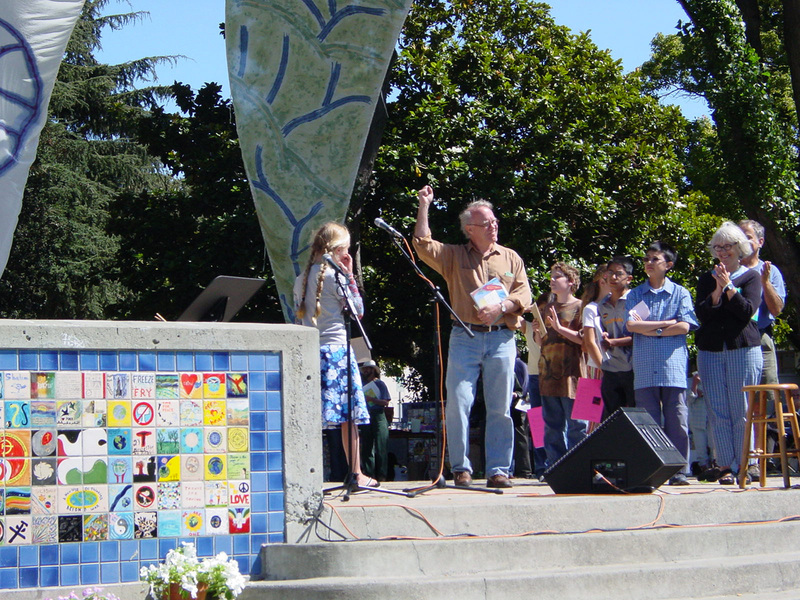 Richard Silberg is associate editor of Poetry Flash. His latest poetry is Deconstruction of the Blues. The Horses: New and Selected, is forthcoming in 2012. He won the Northern California Book Award in Translation for his co-translation of Korean poet Ko Un's The Three Way Tavern. He leads Poetry Flash's Workshop, The Dialogue of Poetry.